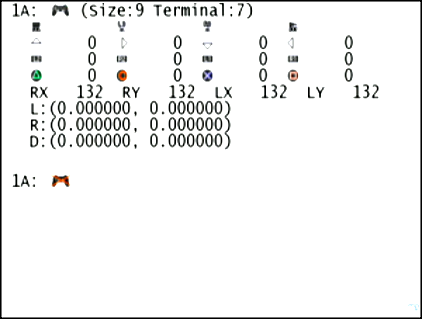 PS2 ELF for testing Playstation 1 Original/Dual Analog/Dualshock 1 and Playstation 2 Dualshock 2 controllers. Tests the digital and analog functions with a 0-255 scale. To test vibration, hold 'triangle', then move the left joystick down for the strong motor (that seems to have 96 positions), or press up and down on the directional pad for the weak motor (that has 2 positions). Full credit to jbit of ps2dev.org, and in #ps2dev on freenode.net, for making this useful program.